Description: Other Space Empires V related files. Syntax file for use with the Editplus text editor. Can probably be adapted to other editors that use similar settings files. Genesis is a map editor for Space Empires 5. You can create maps from scratch, or generate a random map and customize it. Mods are fully supported. REQUIRED: You must have the Microsoft .NET Framework version 2 installed in order to run Genesis. 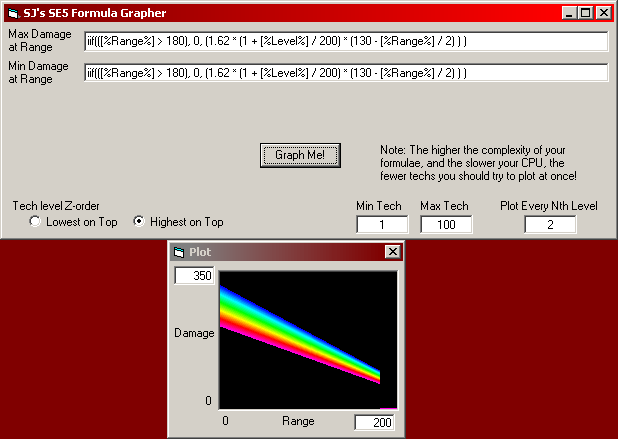 A tool that allows you to quickly create formations for SE:V using a point-and-click interface. Renders a chart showing the max/min damage vs. range vs. tech level of a weapon formula. This script lets you run Space Empires V in a "fullscreen window", as is popular with many games today. A fullscreen window is essentially a window that has no border and covers the entire screen. Running SE5 in a fullscreen window improves its performance (at least when running in Safe memory mode). It also reduces flickering on Windows 7 (also only in Safe memory mode) and makes alt-tabbing quicker and safer. "SE5MapCreator" is visual GUI to create and edit (previously created by the same application) maps for SE5. It can't edit the maps generated by the game, as the encryption used by Malfador hasn't been released, or at least I don't know it. This Map Creator / Editor uses the mapcompiler released by MM. This Map Creator couldn't have been written without the base put by Rick (rick@gibbed.us) and his map creator for Space Empires 5 ((c) Malfador Machinations 2006) (more info on http://www.spaceempires5.com/en-US/project/rmg). Speed up creation of custom scenarios for SE5! Perform hundreds of turns worth of setup in only a few turns. Complete instructions in the enclosed readme. This program helps to create component slot layout files for ship sets. A quick and dirty weapon damage formula builder app. Note that it requires the .NET Framework 2.0.